The Berger Picard originated in France. This is one of the oldest of all the French Shepherds. The breed was officially recognized by the AKC in 2015. The Berger Picard will reach heights of 21 - 26 inches and will weigh between 50-70 pounds. The coat of the Berger Picard is about 2.5 inches in length. It is a thick, harsh, crisp coat that is strong and does not fly around in the air. The coat comes in the following colors: grey, red-grey, grey-black, blue-grey, and light or darker fawn. The Berger Picard is a pack dog. It must be a member of your pack. It does not do well being isolated from the family. The Berger Picard needs early socialization with family, friends and children. The Berger Picard is a pack dog. It must be a member of your pack. It does not do well being isolated from the family. The Berger Picard needs early socialization with family, friends and children. The Berger Picard will learn quickly but needs a trainer who can display a natural authority. The Berger Picard is an energetic and sweet-tempered dog who does well with children and loyal to the family. They are alert and do well as a farm guard. You can find Berger De Picard puppies priced from $2200 USD to $2200 USD with one of our credible breeders. Browse through our breeder's listings and find your perfect puppy at the perfect price. The Berger Picard will learn quickly but needs a trainer who can display a natural authority. The Berger Picard is an energetic and sweet-tempered dog who does well with children and loyal to the family. They are alert and do well as a farm guard. The Berger Picard does not require much in the way of grooming. Their waterproof coat only requires a comb or brush once or twice a month during shedding season and less than that during non-shedding season. The fur of the Berger Picard does not need trimming or washing. They can just be cleaned off when dirty. This breed is a light shedder. The Berger Picard requires a firm, consistent, confident, gentle trainer who exudes a natural authority. The Berger Picard is sensitive to the sound of your voice so it is not necessary to be harsh with them. 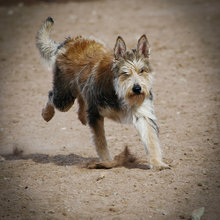 The Berger Picard is an active breed of dog and they require a lot of activity. Long daily walks are encouraged. This breed also enjoys swimming and can be used as a jogging partner. Berger De Picard Puppies for Sale - Shipped Worldwide! Finding the right Berger De Picard puppy can be dog gone hard work. PuppyFind® provides a convenient and efficient means of selecting and purchasing the perfect Berger De Picard puppy (or Berger De Picard puppies) from the comfort of your home, 24 hours a day, 7 days a week. Take advantage of our PuppySearch or leisurely browse our directory of hundreds of dog breeds, Berger De Picard dog breeders, Berger De Picard dogs for adoption, and Berger De Picard puppy for sale listings with photos and detailed descriptions. Some Berger De Picard puppies for sale may be shipped Worldwide and include crate and veterinarian checkup. Many Berger De Picard dog breeders with puppies for sale also offer a health guarantee. With thousands of Berger De Picard puppies for sale and hundreds of Berger De Picard dog breeders, you're sure to find the perfect Berger De Picard puppy.